Araya’s neck was bruised as if it had been tightly tied by a rope. Her gold necklace worth about Bt20,000, gold bracelet worth about Bt40,000 and her gold ring worth about Bt5,000 had disappeared. 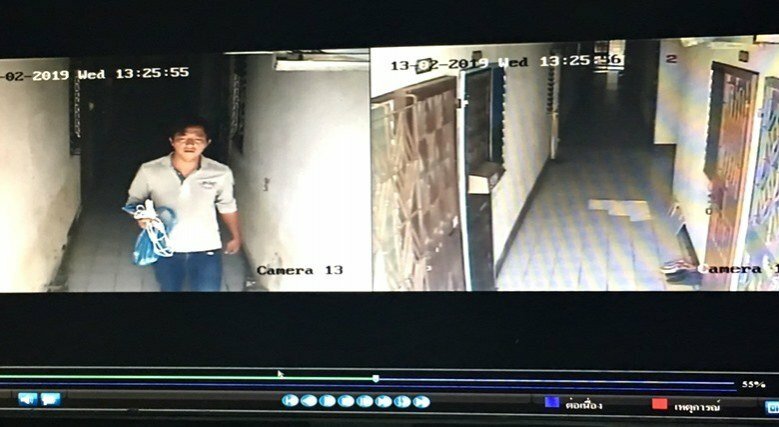 Her daughter, Pornthip Chuasuksarnthong, 41, told police that her mother left her clothes shop at noon on Monday, saying she would was going to rent the condo room to someone. After Araya did not return home, her son went to the condo to check and found her body. Police checked footage of security cameras at the condo and saw an Asian man walk into the room with Araya at 1pm and then leave the room several times. As he left for the last time, he could be seen carrying a blue plastic bag with a nylon rope inside. Pornthip told police she believed the murderer was a Chinese man who had claimed to be Araya’s relative. Pornthip said her mother’s ance﻿stors had migrated from China and instructed her to help any relative from China if they were in need. Pornthip said two years ago, a Chinese man claiming to be Araya’s relative had come to rent the room and borrowed Bt120,000 from her. The man later stole her ATM card and withdrew Bt400,000 before fleeing back to China. Pornthip said her mother had filed a complaint with the Bang Khen police. Pornthip said the man, who she knew only by the sound of his first na﻿me as “Kukko”, had called her mother to say he was visiting Thailand and wanted to repay her the money.